Howdy!!! So recently, I read about Bundle Monster on amazon, and of course, had to order the plate set, I mean come on - 21 plates for $17.99 with free shipping? Yup, I'm in. These plates are exactly like Konad plates, but with different designs. I've purchased all the Konad plates I really wanted in the last 6 months, so after I saw the new images on these- I had to get them- the images are awesome, and right up my alley, not a ton of girly stuff, great patterns, and other great images! Plus, for $17.99, I couldn't really beat it. 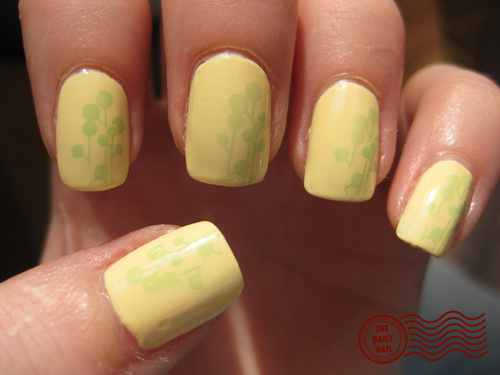 Today, i decided to use one of the plates along with one of the new American Apparel colors, Butter, which I reviewed today on The Daily Nail Reviews. Hope you like it! I learned that Damone Roberts 1968 is not great for Konading, argh!! lol This is pretty subtle, but has a lovely spring feel to it. It reminds me of a sun dress that my two-year old cousin has. Heehee! How funny. I did my nails today with that exact same design. I'm unemployed while in college so I can't afford any real Konad plates, so I jumped on the Bundle Monster plates. I only used it on my thumbs, though. I was thinking about getting the Konad system and was wondering how the image plate holder works. How are you supposed to use the images in the center if there's a hole in the middle of the holder? But anyways, I absolutely love your blog! It inspired me to paint my nails since I haven't in forever! Here are the pics: argyle and stripes!